Picture the scene – a wooden cabin in the middle of the forest, snow coating the trees outside and a log fire crackling in the warmed interior. Few of us don’t find the idea of that highly inviting, but the fact is that real fires come with real headaches – not only the safety issues of naked flames within the home, but also the obtaining and upkeep of the fuel pile, constant vigilance and effort to maintain the fire, and an inability to simply “switch off” (or even control) the heat source. Many people opt for an electric fireplace to combat these problems, but the effect can never be the same as the real thing – or can it? Unlike European homes, houses across Australia don’t necessarily incorporate a fire of any sort in the living room. For most of the country, for most of the time, heat is not something that is craved – rather, we’re trying to get rid of it from our homes! Therefore, the log fire is a distant dream for many of us. Which is where the Dimplex Opti-myst steps in – to provide that much-loved ambience in homes, without the need for complex safety requirements or creating a sauna effect in your own living room! And that is exactly why it is the winner of a 2014 Canstar Blue Innovation Excellence award. Dimplex’s 3D Opti-myst creates the illusion of a real log fire in an electric fireplace, using revolutionary ultrasonic technology to create a flame and smoke effect. As mist rises up through the logs, projected light reflects against the water molecules creating a convincing illusion of flames and smoke. 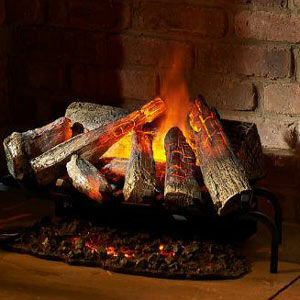 The result – all the trimmings of an authentic-looking traditional wood-burning fire, which can be used as a heat source or not, as the season demands. Canstar Blue Innovation judging panel member Andrew Spicer described the Opti-myst effect, simply, as definitively having the “wow factor!”. The innovation here is in this product’s versatility. Veing electric, the Opti-myst can be moved from room to room, and also has the option of being a heat source or simply an aesthetic addition to the room – as well as the use of technology to create a log fire effect far more realistic than anything seen previously. The Dimplex Opti-myst currently retails at $800. Our Innovation Excellence Awards have been determined through a panel of judges, who adhere to a strict awards methodology – outlined below. Brands or representatives of brands submitted products for consideration to us for judging. We also accepted consumer submissions, where anyone in the public could submit products they thought were worthy of an Innovation Award. Each submission type was given equal weighting by our judges. A single legitimate submission was all that was needed for a product to be considered by our panel, and only submitted products were assessed. To be described as innovative, we assess both the degree of innovation and the overall impact the product could have. In terms of degree, we consider whether there are any other similar products available, whether it is a “first” in Australia or New Zealand and whether it opens up any new markets.